"This world is a dream we all contribute to, in one way or another. We are part of the dream, if we are aware or not, if we like it or not. These pictures are a part of my dream, of the way I exist and act in the world." ".... you can spend days travelling around, walking around, looking at a window, and just the possibility that it could be a picture, even if it doesn't become one, you're looking at something, you're actually paying more attention. " "Recently, I'm doing digital photography almost exclusively. I have old cameras, two from 1903 which I sometimes also continue using." Do the directors, the screenwriters, the photographers that you meet in film projects influence your artistic work? When I'm working on a film, I don't take photos on the set, but yes, what the photographer does influences me, if he does interesting things and gives me something. I'm also influenced by the story that we're telling and the character that I'm preparing. As a result, I take a kind of photos that I wouldn't have done if I hadn't been part of that production. So how good a photographer is he? I've looked at two of Mortensen's books and from that evidence I would hazard the opinion that he is very good indeed. It's not pretty pictures he's after, it's the thread of his existence as Viggo Mortensen. But paradoxically his pictures can be pretty. They can also be sophisticated, crude, elegant, or mundane. He plays the camera like a musical instrument. It's a conversational kind of photography: it's Viggo telling you who he is with images. He looks at everything, believes everything has a meaning, and he shows you his pictures in the belief that seeing might reveals the hidden mysteries of everyday life. He got the idea for the exhibition [sadanset] while he was looking at pictures and discovered that two of them sort of continued in each other. He got interested and the next 14 days he worked his way through a pile of pictures to find photos that could continue the horizon-line and make the puzzle more complete. Also five pictures from one of Mortensen's earlier books raised his interest. The five photos are very similar, but originate from different continents. The pictures show, according to the artist, that people and landscapes are connected. "Some of the pictures are good, even if they stand alone. Others are not that interesting" he judges. He continues "But it is the Whole, that is important to me." In a rather humble statement from someone of such artistic stature and talent, there were only a few of Mortensen's works on display. But, the small room dedicated to his work dictated only a few images could be mounted well. Mortensen's photographs are humbling and a bar artists should hope to achieve themselves after thirty plus-years of photographing. Mortensen likes sotto voce details; he gives his attention to instants that would otherwise have passed by unobserved, or more significantly, unregistered - things that in a literal sense were simply there for him because he was there for them - things that would have easily passed by as all else passes by, as we ourselves finally do. Wandering around the gallery in bare feet sporting a Lord of the Rings shirt, Mortensen describes how one series of photographs on show were a bit of a fluke. Lost 1,2,3 and 4, he jokingly calls them, were taken when he was geographically challenged in the bush on the West Coast one night. The photographs were snapped so that the flash might give him light to get his bearings. "I eventually had to lie down under a tree for a while till the moon came over me and I could figure out where I was." 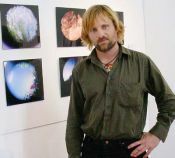 Viggo Mortensen at the Massey exhibition, NZ. Rebecca Wilson is curating his show at the Hirschfield Gallery. She says Mortensen's lyrical photographs are carefully observed meditations on life around him, and include portraits, landscapes and abstractions. "His sensibility as a painter is a strong thread in his photography, where colour, light and movement express the artist's often intuitive response to his environment." Mortensen hasn't had time to do much painting the past couple of years. "In a way, I'm painting with the camera now, using more movement, getting less tidy and more aggressive," he says, pointing to an image from the Perceval Press catalog. "I'm experimenting with more abstract images, longer exposures." "I was used to printing my pictures in the traditional way, but now I use the more up-to-date and common medium, the digital one. But I have a great respect for the image: all my pictures are shot on film, then I scan the negative. Basically, you get the same result, but more quickly, and for me, when you publish books, it's very important. Today, the paper and the ink are so good that the picture keeps the black and the contrast very well. In conclusion, the quality is as good as the one from the traditional print, so why not?"